The characterisation of agents' preferences by decreasing absolute risk aversion (DARA) and constant relative risk aversion (CRRA) are well documented in the literature and also supported in both empirical and experimental studies. This paper considers a financial market with heterogeneous agents having power utility functions, which are the only utility functions displaying both DARA and CRRA. By introducing a population weighted average wealth measure, we develop an adaptive model to characterise asset price dynamics as well as the evolution of population proportions and wealth dynamics. 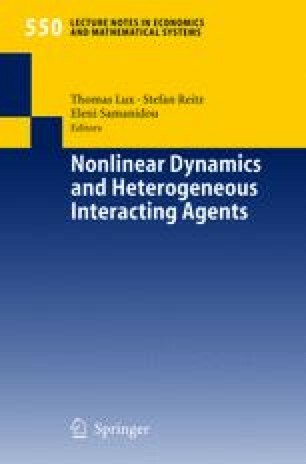 Some numerical simulations are included to illustrate the evolution of the wealth dynamics, market behaviour and market efficiency within the framework of heterogeneous agents. Acknowledgments. An early version of this paper was presented at the International Workshop on Economic Dynamics at the Lorentz Center at the University of Leiden, The Netherlands, June, 2002 and the 8th-International Conference of the Society for Computational Economics, July 2002, Aix-en-Procence, France. We would like to thank all participants for stimulating discussion. Special thanks are due to Thomas Lux for detailed comments and suggestion. The authors are responsible for any remaining errors in this paper. We also acknowledge the helpful comments of anonymous referee.